This report explores the attitudes and experiences of two groups of adults. The first are those who are self-identified Hispanics. This is the usual group of Hispanics that are profiled in Pew Research Center and Census Bureau reports and are reported on as a distinct racial/ethnic group. Throughout the report, this group is labelled as "Self-identified Hispanics." The second are those who have Hispanic ancestry but do not consider themselves Hispanic –i.e., self-identified non-Hispanics with Hispanic ancestry. This is the first time this group's opinions, attitudes and views have been studied in depth. 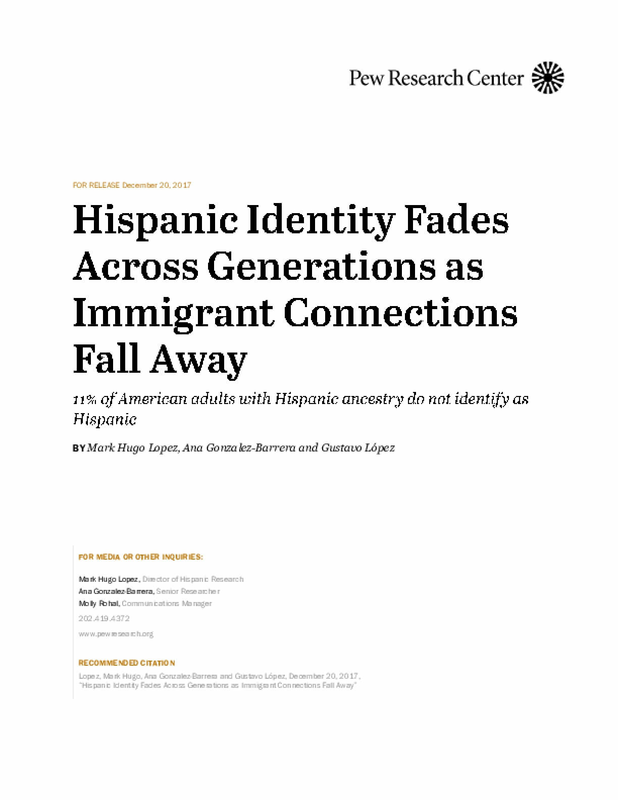 Throughout the report, this second group is referred to as "self-identified non-Hispanics" or "self-identified non-Hispanics with Hispanic ancestry." Racial and ethnic identity on surveys and in the U.S. decennial census is measured by respondents' self-reports. Any survey respondent who says they are Hispanic is counted as Hispanic, and those who say they are not Hispanic are not counted as such. This practice has been in place on the census since 1980 for Hispanic identity and since 1970 for racial identity.